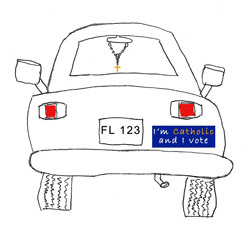 Each election cycle, the Florida Conference of Catholic Bishops conducts the CQP in an effort to assist Catholics and the broader community with the obligation to become informed voters. The CQP asks all 2016 U.S. Congressional and Florida legislative candidates their positions on eight public policy issues of concern to the Church. Candidates are offered the opportunity to state their positions as well as brief comments on each question. Before you cast your ballot in the Primary, take the time to see where your candidates stand. You have received this message because you have subscribed to a mailing list of Florida Conference of Catholic Bishops. If you do not wish to receive periodic emails from this source, please click below to unsubscribe.